Unless my memory fails me, this was the second Grainline Archer I ever made. I think I ended up getting the fit right on my third try. I still wore the original version of this shirt, but it’s become way too tight across my shoulders since my return to the pool. It was time to put this shirt to better use. I was lucky enough to have a decent sized remnant of the original fabric in my stash which meant I could go to town with my flounces. As beautiful as they are, flounces are very big fabric hogs! I wish I took photos of my refashion during the process. I didn’t. However, I’ve drawn a few diagrams to help. It wasn’t a complicated refashion. I started by cutting off the sleeves of the shirt. Then I pencilled my intended seam on the remainder of the shirt. The diagram below shows the new seam I created. The front seam is red (on the front shirt pieces) and the back seam is green (imagine it on the back shirt pieces). Both are connected at the shoulder seam. I wanted the diagonal seam to be wider at the shoulder yoke seams and more medially placed towards the shirt hem. I brought the seam closest to the CF in the front of the shirt. The scariest bit was cutting along this seam and keeping both sides exactly even! After cutting, I then had three shirt pieces that I needed to stitch back together, taking into account the new seam allowances that would be eating into my shirt size! For the flounce, I simply measured the entire length of the new seam and used that as a reference for the curved edge of a flounce. A flounce pattern piece is basically a big circle. I made mine a bit wider at the centre point (the area covering the shoulders). I also added an extra four inches (approx.) to the length of my flounce as I knew I wanted to add a couple of pleats over the shoulder region. The diagram below is an approximate representation of my flounce piece. Imagine it trued and smooth in real life! I faced the flounce with self-bias-binding before I sandwiched it between the pieces of shirt. And once the flounce was attached and the shirt was in one piece again, I tried it on. I used 1cm seam allowances with my new seam so I knew that I lost exactly 8cm in shirt girth by inserting the flounce (2cm on each front and back seam). To compensate this, I decided to add contrast white panels down the sides of the shirt. This alteration in turn, would eat up another 2cm on each side of the shirt. So, I measured 8cm wide panel pieces to attach to the sides. The panel width is 6cm (incl. 2cm of seam allowances). These side panels returned the shirt to the same shirt-fit as before. I then bound the armscye and hemmed the bottom a little straighter and shorter than before. I’m not joking when I say that this is my new favourite skirt. I’ve already worn it a lot. It pairs beautifully with skirts for an elegant evening look. But I also love it with jeans when I’m aiming for polished casual. This entry was posted in cotton, flounce, refashioning, ruffles, Tessuti Fabrics, tutorials and tagged Archer, cotton, diy, fashion, flounces, Grainline patterns, refashioning, restyling, ruffles, sewing, shirt, Tessuti Fabrics, tutorial on April 26, 2017 by Debbie Iles. I’ve always been a bit partial to a statement sleeve. And right now, flared sleeves, bell sleeves, and even gathered sleeves are just about everywhere. I want to share with you a quick way to update an existing collared shirt, or any shirt for that matter. I started with a a basic white button up. Mine was purchased from Target for a grand total of $22, specifically with this project in mind. I toyed with the idea of sewing myself a shirt from scratch for all of five seconds. But as you should all know by now, I’m not so in love with sewing basics. I started by cutting the cuffs off a basic shirt and with them, about six inches of sleeve. I then measured the circumference of the cut portion of the sleeve and used that as a guide to draft the new cuff. I drafted a new cuff (just a big rectangle) that measured 8.5 inches in width and 12 inches in length (including a 5/8″ seam allowance). The cuff width allowed for a three inch overlap, to line it up with the underarm sleeve seam when sewn in place. I then slashed and spread the cuff to turn it into a flared design. See the picture of the new pattern piece (below) to get an idea of the amount of flare. The pattern piece is cut on the fold and two cuffs need to be cut (one for lining, one for outer fabric). Because of the size of these new cuffs, I chose not to interface them, which turned out to be the best decision. I also played around with the position of the overlap/slit of the cuff and found it worked best (appearance and practicality) when it was positioned on the underside, with the back overlapping the front. This positioning suits the natural movement of the arm better. I’m delighted with my modified white shirt. I’m currently considering which other shirts in my wardrobe might need a similar update. 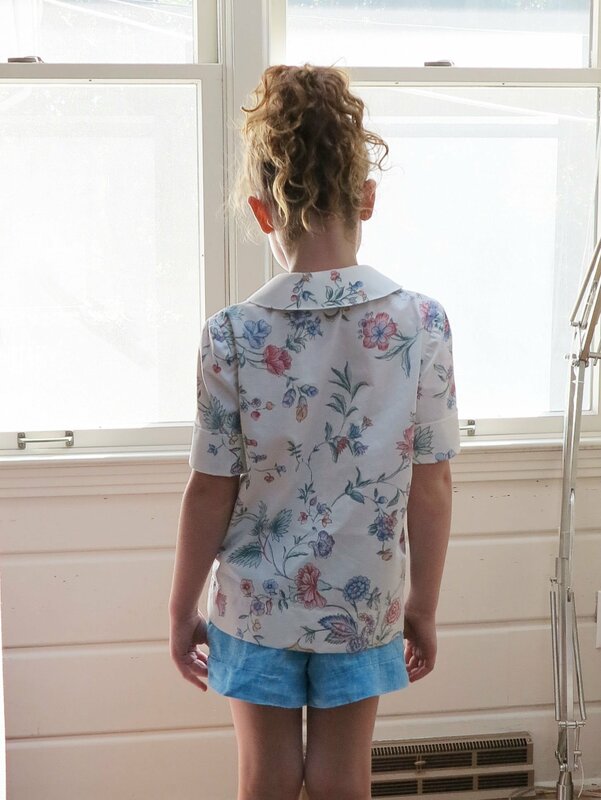 This entry was posted in cotton, cuffs, refashioning, self-drafted, shirt, shirting, tutorials and tagged cuffs, diy, diy fashion, flared, refashioned, sewing, shirt, sleeves on October 3, 2016 by Debbie Iles. Once upon a time, this shirt pattern was an Archer. I’ve adjusted it quite a bit to fit, as well as switched out the cuff plackets for a more polished look. I also removed the back pleat. In this version, I introduced a covered front placket, lengthened the back hem, and left off the collar. The fabric is silk crepe de chine. I was immediately drawn to the colour of it. I love silk CDC. 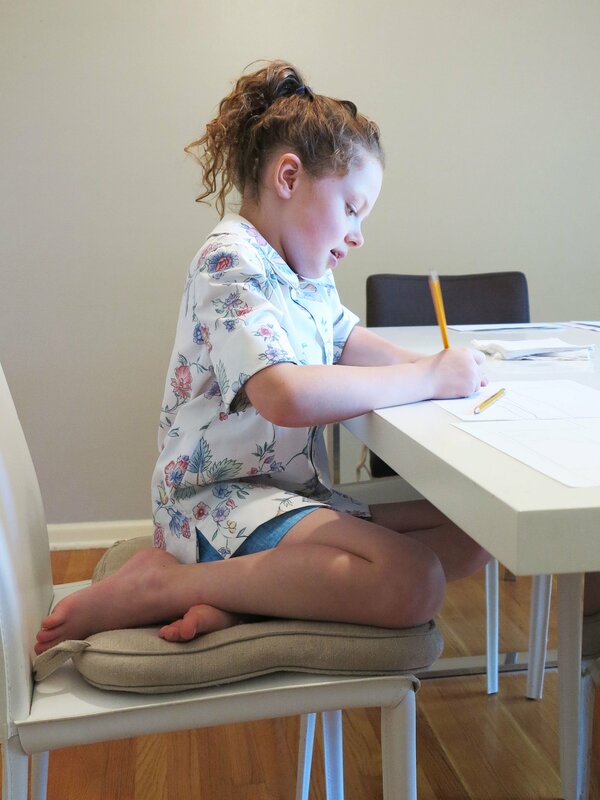 It’s not difficult to sew, but it does take time and patience, especially when you start adding extra design features like cuffs, plackets and collars. I couldn’t use my standard shirt interfacings on a silk shirt like this, which was lightweight and slightly translucent. I needed an interfacing that wouldn’t be too stiff or visible through the fabric. I used beige silk organza (hand-basted in place) to interface the placket, cuffs, and collar band and it worked beautifully. The white jeans were thrifted from an estate sale. They were too big around the waist but fit fine on the derriere (my standard issue with RTW jeans). The legs were also a looser, straight leg style, which unless I wanted to dive headfirst into a BH90210 episode, needed to be corrected immediately. I narrowed the waistband and the leg inseams. I also shortened the crotch a smidgen. I didn’t touch the outer leg seam because that would have twisted it around too far towards the front (and I was being lazy by skipping seam-ripping with this seam). Lastly, I attacked the knees with a cheese grater. I went conservative on the DIY distressing because I’ve learnt from past experience that dressing quickly (which one always does if they have kids under eight) results in one’s feet being pushed through the distressed sections of jeans. These jeans will no doubt become more distressed as time progresses, which is kind of what I want anyway. This entry was posted in denim, shirt, silk, top and tagged Archer, crepe de chine, diy, Grainline patterns, jeans, shirt, silk, top on February 1, 2016 by Debbie Iles. Remember the last wrap skirt I made? Well, not long after I made it, I spotted this Tibi skirt on Instagram. And as fortune would have it, I had just the right amount of (Perfection fused) leather leftover in my stash. I’m not exactly sure how this leather is made. It looks convincing but it definitely doesn’t compare to genuine lambskin. It is very affordable and easy to sew. The underside is fabric and the outer is leather. I find it doesn’t press/glue quite as neatly as the real stuff, but it is lightweight, quite fluid, and without flaws, which makes sewing with it very economical. I used the same basic pattern as my last wrap skirt. It is a very simple modification on a pencil skirt (details here). However, this time I created a facing instead of a waistband and added a strap to wrap around my waist and tie secure at a silver ring. I didn’t line this skirt because the fabric backed leather didn’t require it. This is a fun skirt. I’ll enjoy wearing it before the weather gets too cold. And later, I might have a go at layering it with jeans or skinny pants. This entry was posted in cotton, leather, shirt, shirting, skirt and tagged corduroy, faux leather, leather, shirt, skirt, vintage fabric, wrap skirt on October 28, 2015 by Debbie Iles. So, I loved Miss Seven’s vintage sheet shirt so much that I just had to make my own. Here it is. My Grainline Archer has been modified to accommodate my standard broad back/long arm/height requirements. I also added a classic, tailored sleeve placket, and two fish eye darts in the back. 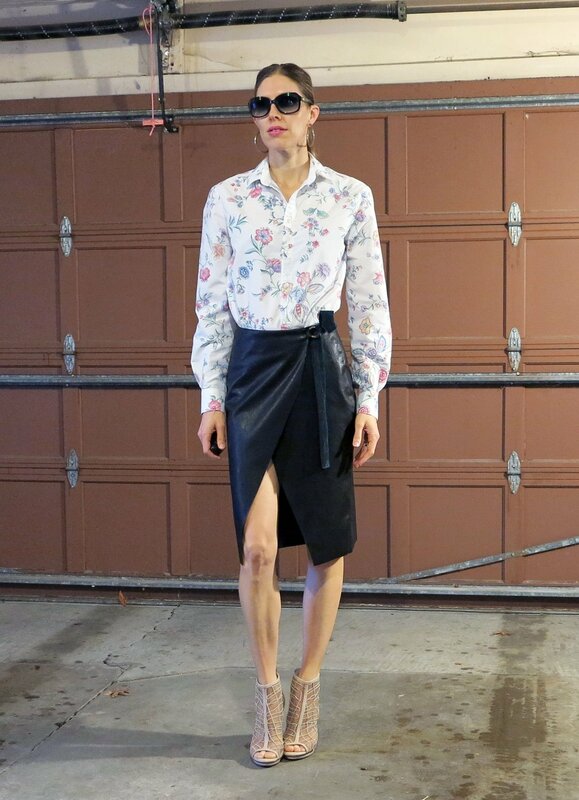 This entry was posted in cotton, Grainline patterns, neoprene, refashioning, shirt, shirting, skirt, top, upcycling and tagged Archer, faux leather, floral, Grainline patterns, neoprene, shirt, skirt, top, vintage fabric on October 21, 2015 by Debbie Iles.